It’s video-intensive post this week, as I’m feeling lazy. This is a selection of videos I’ve been amused by this week. Firstly, male models singing and dancing about stuff, just cos they can I guess. I really enjoyed these clips by comedian Drew Doege, who imitates – and mocks – ubercool fashionista Chloe Sevigny (and NY hipsters in general). And here is Chloe herself talking about her new collection for Opening Ceremony. Pay attention – this is what we’ll be coveting/finding cool/looking like next year. Get your zombie gleek on! 28.07.11 | Permalink | Comments Off on Get your zombie gleek on! 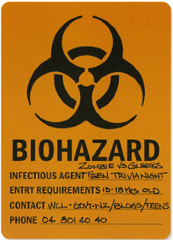 It’s on again – the Zombie vs Gleeks Trivia Night (we had to postpone it last time – sorry, won’t happen again). You, your mates and zombies, Glee, prizes, gloating rights, free food, brains! Wait, what…? Okay, there might not be brains, but eveything else will be there. Pull a team of Glee and Zombie experts together and get ready for the Zombies Vs. Gleeks Trivia Night. Open for teams of 13 to 18 year olds (min 2 – max 4), the Zombies Vs. Gleeks Teen Trivia Night will be at the Wellington Central Library on September 2nd at 6.30pm. Registrations open soon and places will be limited so get your team ready to go and start planning your costumes. A Writing Master Class for Teenagers with John Marsden. Best-selling Australian author and teacher John Marsden (author of the Tomorrow when the War Began series) will be presenting a writing class for young writers as a fund raiser for Christchurch. Saturday 13th August 10am to 12pm, Wellington City Library, Victoria St. (Mezzanine Floor), for 13-18yr olds. Cost $30 -at the request of John Marsden all proceeds will go to the Red Cross Christchurch Earthquake Appeal. Strictly limited to the first 30 people on a first come/first served basis- to book please contact the Children’s Bookshop, Shop 26, Kilbirnie Plaza, Kilbirnie, Wellington. The International Film Festival is starting this week, and there are some really good films screening. They are all good! Sure! But some might be better than others. Some are rated 16+ or 18+, so might be out of your league. But the tickets are pretty reasonably priced for students/under 15s, so you have no excuse really. Troll Hunter is a Norwegian mockumentary that I am particularly looking forward to. The trailer (below!) is great. Space Battleship Yamato! The title says it all. Space! Battleship! Yamato! Here’s the official website. And here is the trailer. Or maybe several trailers together. It looks epic – if you don’t want to see it then I don’t know what to tell you. Another Japanese film worth watching is Studio Ghibli’s latest, Arrietty. Trailer! Go! There are heaps more. Browse the website! 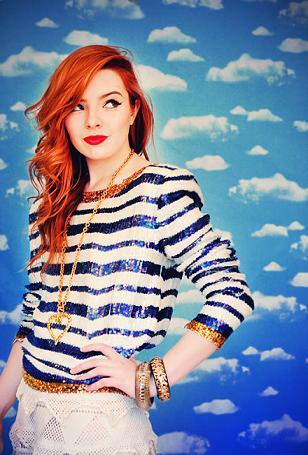 This is the lovely, and preternaturally stylish and glamorous, Jane Aldridge of wellknown blog Sea of Shoes. I love her as she loves shoes, Japan and small dogs even more than I do. 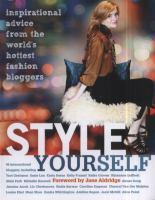 ‘Style yourself: inspired advice from the world’s fashion bloggers’. Jane wrote the introduction to this new style guide, which the library has recently acquired. (It also features advice from Susie Bubble and Tavi). It’s not on the shelves yet and I can’t wait till it arrives – it looks like a goodie. You can read about the book here, reserve it here, or read an interview with Jane (about this book) here! What once looked cute and was taken up by our favourite reality-celebrity, Lauren Conrad, has now trickled down to Snooki and JWoww. That makes it questionable and perhaps a trend to skip. It’s time for a new batch of soon-to-be-published bestselling titles – reserve your preferred sequel / series continuer / riveting conclusion now, so you don’t have to wait! The Power of Six, Pittacus Lore. This is the next in the Lorien Legacies, after I Am Number Four (the DVD has arrived in the library recently), and it focuses on Number Seven (who’s got a bit more breathing room than Number Four). There’s an exclusive extract here, or you can become a follower of Lorien Legacies on Twitter for more tips and things. Crossed, Ally Condie (November/December 2011). Sequel to Matched, in which Cassia takes off to the Outer Provinces to track down Ky, which is a very basic straight forward summary of a mission that will be far from straight forward or basic. 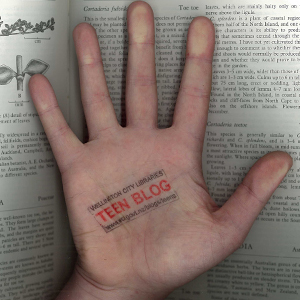 Have a look at the series website, or visit Ally Condie’s blog here. Bloodlines, Richelle Mead (August/September 2011). Vampire Academy fans will be pleased to hear that this is the first in a new series, a Vampire Academy spinoff series even, and so you’ll recognise the world of vampire princesses and their protectors, so thumbs up! Read more about it here. Inheritance, Christopher Paolini (November/December 2011). The final book in the Inheritance cycle will finally be here! Will Eragon and Saphira get the better of Galbatorix? You can read and excerpt here, watch some images of swords, dragon scales and eyes in the book trailer below, or catch up with more Inheritance news at Christopher Paolini’s website here. People’s Republic, Robert Muchamore (August/September 2011). Meet 12 year old Ryan, CHERUB’s new recruit. Has he got what it takes to take on the most ambitious CHERUB mission yet? In the mean time visit the CHERUB campus for more info. Silence, Becca Fitzpatrick (October/November 2011). The final in the Hush, Hush trilogy. There is an official Hush Hush fanclub – fallenarchangel. The site has FAQs, playlists, and more photos of and info about the famous cover model for Hush, Hush. There’s an official Silence countdown widget to be got at the author’s website here (perhaps the perfect gift for the reader who has everything?). The Fear, Charlie Higson (September/October 2011). The next in the Enemy series, in which everyone over the age of 14 has become a zombified predator. Dog Nut and his mates must travel across London in search of lost friends, avoiding the terrifying, blood-thirsty adults. You can read Charlie Higson’s blog post about the book here. The Clockwork Prince, Cassandra Clare (December 2011). This is the next in Cassandra Clare’s Victorian Steampunk with Shadowhunters series (the first being Clockwork Angel), and we will be ordering it next month! Two noteworthy music videos were released yesterday and they will battle it out on your computer screens in our new feature, Rock Fight! How exactly do pieces of film set to music battle you ask? By being watched sequentially and then voted on in the comments. Easy. Our first combatants in the ring are The Beastie Boys featuring Santigold with Don’t Play No Game That I Can’t Win off their album Hot Sauce Committee Part Two. Taking them on in this titanic struggle is Rebecca Black with her new song, My Moment. She doesn’t have an album yet because she is such a fresh new artist, but I understand an ep is in the works, look for it coming to the library soon! Now that you’ve sized up both contenders, vote for your favourite in the comments. Who will win the Rock Fight!?! 19.07.11 | Permalink | Comments Off on Trailer Tuesday! There are SO MANY movie trailers out. It is exciting! An exciting time to be into film! First, and it’s a week old I know, is Tintin, which needs no introduction. Watch it here at the official site! What? The? Heck? A Glee movie. In 3D, too. Brian Selznick’s The Invention of Hugo Cabret has been made into a film. It is a kid’s book, sure, but I am certain that it can be enjoyed by all ages. Like Harry Potter, or Lego. Here is the trailer. Edgar Rice Burroughs wrote the original Tarzan stories. A hundred years ago! That is how old Tarzan is. Burroughs also wrote about John Carter, a man from Earth who ends up on Mars, where he saves the planet’s inhabitants (we don’t seem to have any of the books, sadly). And now a film has been made! Here is the first trailer. There’s still one more trailer! It is for the new Batman film, The Dark Knight Rises. Go here to watch it (some trailers just don’t want to be embedded!). It’s only a teaser, so don’t expect too much. Because really it’s just a man in a hospital bed talking.